Snapchat: Why teens’ favorite app makes the Facebook generation feel old. Is Snapchat Really Confusing, or Am I Just Old? A 32-year-old’s hopeless quest to understand America’s fastest-growing social app. Get off my lawn, Snapchat. There is no excuse, at this point, for a professional technology writer to be confused by Snapchat. It has something like 200 million active users. It is, by some metrics, the fastest-growing social app in the world. It has been the subject of Wall Street Journal think pieces, Forbes profiles, and how-to guides for panicked parents. 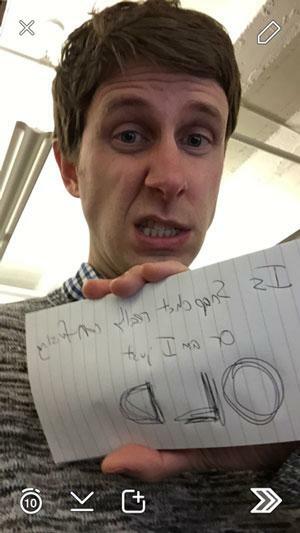 It’s 2015, for Zuck’s sake, and Snapchat’s basic functionality should be old news by now. And yet, every time I try to use it, I feel like my father must have felt when I was 9 years old and challenged him to a game of Sonic the Hedgehog. I end up flustered and sweating, haplessly punching runic symbols in a doomed bid to accomplish the basic task of viewing my friends’ messages before they expire. Snapchat, in short, makes me feel old. I recently discovered, to my great relief, that it isn’t just me. Snapchat makes almost everyone over the age of 25 feel old—even people who had never felt particularly old before. And that might be its greatest appeal. Before we go further, you should know that I’m not exactly Montgomery Burns. I’m 32, which by most measures makes me a millennial, if only just. Like any self-respecting member of my generation, I while away my days tweeting, snapping selfies, watching Vice TV, and voting for Barack Obama. I write bloggy things on the Internet to sustain my habit of repaying people for burritos on Venmo. Times change quickly, however, on the Internet as in life. Facebook, at least to judge from my news feed, has become primarily a venue for 30-somethings—a.k.a. olds—to post carefully staged pictures of their weddings and babies and commiserate about being in their 30s. Teens use it grudgingly if at all, and when they do it’s probably either for a class assignment or to fool their parents into thinking they’re studying at Brayden’s house when they’re actually rolling at Kayden’s house. Facebook’s evident fall from favor among whippersnappers has, over the past two years, gotten every venture capitalist and tech blogger in the world asking the same question: What’s the next Facebook? That, of course, is a question only an old would ask. The youngs implicitly grasp that there can no longer be a single dominant social network. If there were, all their parents and guidance counselors would soon be on it, and then they’d have to find something else. The closest thing to a new Facebook, however, is probably Snapchat. True, Snapchat is not nearly as ubiquitous as Facebook once was among college students (and still is among adults). By most metrics, it isn’t even as popular as Instagram, which of course is now owned by Facebook, although it is savvy enough not to mention that too often. But Snapchat recently surpassed Instagram and Tumblr as the fastest-growing social app, according to market research by Global Web Index, with rumors of its size growing from 30 million active users a year ago to 100 million six months ago to nearly 200 million today. Those are all just estimates, but it’s safe to say that it’s big and getting bigger. More importantly, it feels spontaneous and a little scandalous in the same way Facebook once felt spontaneous and a little scandalous, in those heady days before it threw open the gates to parents and brands and went from being a social network to The Social Network. At least, I’m told it feels that way by people who ought to know—which is to say, people who are the age today that I was when I joined Facebook. Snapchat, launched in 2011 from a Stanford frat boy’s father’s living room, made its name as a sort of anti-Facebook. More messaging app than social network, it was a place where you could say and do whatever you wanted without fear that it would leave a permanent mark on your record. You could snap a selfie—clothing optional—add some scribbled text, and send it to a friend, and he’d have 10 seconds to view it before it disappeared from his phone forever. Snapchat’s security has never been ironclad, but it still feels a lot cozier than a social network that tracks your every post and click for the benefit of corporate advertisers. In a world in which Facebook is a $200 billion business, Snapchat offers a form of communication that feels less network-y and more social. That may already be changing. Snapchat announced this week that it is launching a “Discover” feature that will allow publishers like Vice and CNN and BuzzFeed to foist their content on its users, just as they do on Facebook. Marketers call this “reaching teens where they are.” Teens probably call it time to start looking for a new social network. But Snapchat is not dead to them yet. Like Facebook and Instagram before it, it will almost certainly grow far bigger and wealthier before it dawns on pundits and industry analysts that the kids have begun to move on. Meanwhile, venture capitalists are pumping it full of cash, and soon Wall Street investors might, too. For now, it is the closest thing we’ve got to an authentic teen social network, which is why olds like me have spent the past two years writing about it on oldster sites like Slate, even though we secretly don’t understand it. I say “secretly” because you will rarely read an article about Snapchat in which the author cops to being hopeless at Snapchat. It is far too late, and Snapchat by now far too mainstream, to admit that you don’t “get” Snapchat and expect to be taken seriously by a tech-savvy audience. And yet the tone and substance of these articles make it awkwardly clear that the authors only downloaded the app so that they could pretend to know what they’re talking about. This week, however, a tech writer I follow on Twitter took the unusual step of admitting the possibility that his judgment about Snapchat’s user interface might be clouded by his advanced age. Am I getting old or does Snapchat need UI help? The unspoken punch line: Alex Fitzpatrick is 26. For a few cathartic minutes thereafter, Twitter become a safe space for tech editors around the country to confess their pent-up ignorance of Snapchat. Their replies came in a rush of agreement and relief. But they left unanswered the original question: Is Snapchat really hard to use, or are we all just old? To get to the root of this conundrum, I started by doing what any hack journalist would. I opened my long-neglected Snapchat app, buried months ago in the bowels of an iOS app folder called “Messaging,” and resolved to give it another shot so that I could once again pretend to know what I was talking about. “You’re not that old,” I told myself. “If your nephew can do this, so can you.” What happened next will surprise you not at all. The app opened with a full-screen picture of what appeared to be a computer keyboard, and behind that a pair of someone’s brown corduroys. It took me a full four seconds to comprehend that I was looking, via my iPhone’s rear-facing camera, at my own lap. Presently I was overcome by the conviction that I was on the verge of accidentally pressing the wrong button and snapping someone a picture of my crotch. I hastily tapped what appeared to be an “x” button on the top left of the screen. Nothing happened. Fairly panicking now, I seized upon a different button at the top right and mashed it ferociously. To my horror, the iPhone switched to its front-facing camera and I found myself staring into my own haunted eyes. I am not sure what button got pressed next, because it was at this point that I dropped the phone unceremoniously onto my brown-corduroy-clad lap. Aware that I was making a parody of myself—senior technology writer, indeed—I inhaled deeply and started over. It soon became clear that the danger of sending an accidental crotch-shot was lower than I had feared. Thus reassured, I began to explore the app in the only manner available to the novice Snapchat user: by tapping on random purple and pink numbers, symbols, and names until things happened, and then trying to piece together in retrospect what those numbers, names, and symbols had indicated. This is not to say that learning to use Snapchat is hard for old people, any more than it’s hard to learn Russian by being dropped onto a Moscow street and forced to navigate the city by trial and error. Let’s say instead that it takes a little practice. In time I worked up the confidence to snap a friend one of those selfies in which you make a scrunchy face and hold up a piece of paper with your message scrawled on it. My efforts were complicated, however, by my inability to immediately locate a pen. This was vexing until I was struck by its profound significance: I may be old, but I’m not so old that I carry pens around! Suddenly I felt much better. But I still needed a pen. sarah.harvard: If you see purple numbers and a purple everything, that’s your friends list. On your snaps (left side), if you click on the top right gear button, that takes you to your settings. You can manage filters and enable Snapcash over there as well. will.oremus: Oh my god what is Snapcash. sarah.harvard: Also, you can send IMs to your friends that snap you. Just swipe right on their snap. will.oremus: Those don’t disappear, I guess? sarah.harvard: Oh, they still disappear. Sometimes within 2 minutes. It really depends on how often you IM each other at that moment, I think. sarah.harvard: I, and a few others, use Snapchat “stories” as like a more private-controlled Vine. Except we use it as if it’s our own show. And we get to control who our audience is by blocking the people we hate/or are afraid of. will.oremus: This is amazing. But wait, to return to the original question, do you find it confusing or are the rest of us just old? sarah.harvard: I feel horrible for saying this, but I think y’all are just really too old for this. I find snapchat really simplistic, actually. will.oremus: Excuse me a sec, I have to go die. Last year, Quartz published an amusing post in which its over-30 staffers uniformly expressed astonishment that its under-30 staffers felt comfortable carrying out financial transactions in public on the mobile app Venmo. But if “the Venmo line” is drawn at 30, the Snapchat line must be 25, tops. It’s tempting to imagine that humans under that age are possessed of magical faculties that allow them to intuit the functionality of an app like Snapchat more readily than the rest of us. More likely, they’re just more comfortable with modern mobile app design, because their expectations haven’t been shaped by years spent using Facebook or Twitter on a desktop computer. I suspect they’re also better motivated. When you’re in your teens and early 20s, your friends are your family, and reinforcing your connections to them via funny photos and messages is a top priority. And it’s imperative that you have a place to do it that’s safe from the prying eyes of parents and future employers. Your social ambitions tend to narrow when you’re 32, married, and expecting a child. And the bulk of your interactions are G-rated. The truth is that Snapchat really could be a lot easier to use, no matter how old you are. It probably will become more geezer-friendly in time. It will have to, in order to attract the kind of mass audience it takes to justify its $10 billion valuation, let alone whatever astronomical, Zuckerberg-ian valuation CEO Evan Spiegel hopes to eventually attain. In the process, however, it will gradually lose the aura of exclusivity that drew people to it in the first place, just as Facebook did before it. 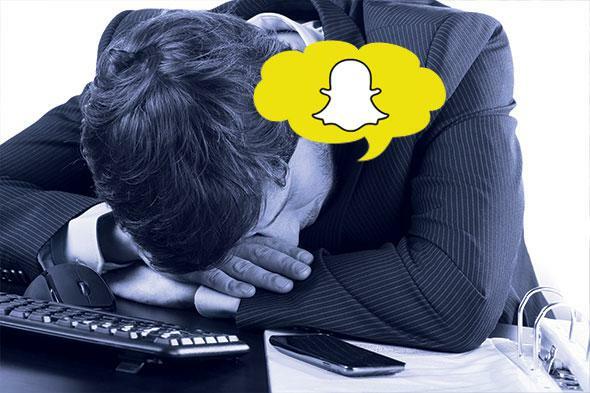 Tomorrow’s teens will move on to other things, and if there’s any justice in the world, today’s Snapchatters will find the next generation’s favorite apps every bit as impenetrable as I find theirs.